Virginia Law asks that cyclists ride on the right side of the road except in situations when it is unsafe to do so, when passing another vehicle of any sort and on narrow roads where there is a single lane going in each direction. 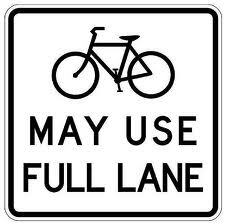 The question of where to ride in the lane arises each day for those who ride to most places they visit. This question is not simply asked explicitly by the cyclist to himself or herself. Rather, it is asked indirectly through the experience and stress by watching motorized vehicles (e.g., cars, cargo trucks. SUVs and lots of smaller vehicles pulling trailers) pass quickly and closely. Guess what? Most drivers of motorized vehicles ask themselves the same question. Rory McMullan in his short but useful text, BIKING TO WORK, part of the Chelsea Green Guides series, describes two types of lane use by bicycles in an effort to answer just this daily-asked question. McMullan writes, “There are two main positions for on-road cycling. 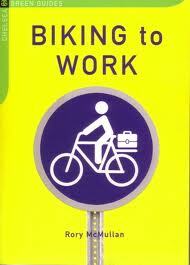 You can ride in the traffic stream (the primary position) or to the right of it (the secondary position).” (47). He goes on to define these two ideas in ways that are clear and work well in getting dialogue going on the topic for all “road users” (a phrase I lifted from BMC professional cyclist Cadel Evans). McMullan argues cyclists pedal in the second position, to the right of traffic, not because they have to but as a concession to the traffic. Of course, many cyclists pedal way too far to the right, in the gutter sometimes, because of low confidence or a feeling they are not supposed to be there. This is not the case as Virginia Department of Transportation has published. Groups such as Active Transportation Alliance in Chicago and Washington Area Bicycle Association in the DC Metro Area have discussed in their literature another facet of how bicycles should safely negotiate roads with the flow of traffic. Their idea covers that slightly tricky space of streets with inconsistently parked cars along the side. The question is asked whether a bicycle should get off to the right during a gap in the line of parked cars on a narrow street so cars can pass at the speed those drivers want. This response seems like a good idea. But as soon as the gap ends, said cyclist must enter the flow of traffic again – an action which only compounds the constant attention the cyclist must use to ride safely. No, as far as I can tell, most advocacy groups promote the holding of a line in the flow of traffic by cyclists. Most drivers would laugh at the cyclist who asks them to pull over into one of these gaps so bike traffic can continue safely and at speed. Yet some of these same drivers will honk incessantly from behind a bicyclist for a variety of reasons. Yes, believe me, we on the road riding our bikes KNOW there is a car right behind us. I would hope each bike rider will gain the confidence to stay in their planned line along the street in these situations of cars parked inconsistently along the side of the road. The other evening on a 5 lane street near where I live (there are also 3 turning lanes in this same section). It’s a busy road. On the most right is a lane that angles in from a small state highway – it continues for about 200 yards or so then angles right as it merges onto another street going east. I was in the 3rd most right lane – a lane which ends in a few lights from where I was riding toward a couple errands. It was dark and rush hour was essentially over – though traffic was still plenty. Nobody was moving inordinately fast. To my right was that lane I just mentioned above. A car was riding along behind me and to my left. For some reason as this car got to the point of where that lane ends and merges right, it suddenly “ran aground” a median separating this merge from the rest of the through-lanes. This happened surely because I was there, though this driver must have thought he or she was going to pass me super quickly on the right (which is extremely unexpected for a cyclist and thus dangerous). I must admit I was startled to hear this, look back and see this car beaming its lights at me with its bumper banged upon the median. I followed the most sensible route along that section because it’s the lightest traffic segment of these through-lanes because it’s technically not a through-lane. Like I said above, this lane ends in a few lights by fading into the two “main” lanes. But let’s make believe I had gone to the right for two hundred yards into that lane. First I would have had to make sure no cars were flying around from the exit off the state highway. If it was “safe,” I could have entered. Of course any cars coming off the state highway would still have to pass me quickly if they were not going into the oncoming merge to the east. And most cars at that segment DO want to get into the straight-lanes. Then I would have had to look back over my shoulder in order to get back into the straight lanes myself. And believe me, these cars DO NOT want to let me get into “their space.” No, it was the right decision and seems a good example of taking the lane in the flow of traffic when it is necessary. And given the structure of the road, I would even call this right side of the road. Any more to the right and I would have been on a street going in another direction into another road. There are no prescribed rules in actual everyday riding for when it is “best” to take the primary of secondary positions. I alternate back and forth depending on the style of road and the width in particular. But I definitely advocate for cyclists to take the lane when they deem it best to do so. Use your best judgment. And the more you ride your bike, the more comfortable you will be handling your bicycling in every situation – riding with the flow of traffic and take the lane is just one of those situations. Thank you for reading. J.L. Safe cycling to you all. Don’t hesitate to leave reasoned comments if you so please. Active Transportation Alliance. http://www.activetrans.org/ (accessed 02 March 2013). McMullan, Rory. Biking to Work. Dartington, UK: Chelsea Green Publishing Company, 2008. Washington Area Bicycle Association. http://www.waba.org/ (accessed 02 March 2013).